Mortgage Bonds: It's a Trap! HomeBusinessMortgage Bonds: It’s a Trap! Mortgage Bonds: It’s a Trap! On Wednesday Vanguard announced that their fixed income index funds would be switching from the Barclays Aggregate to the Barclays Float-Adjusted Aggregate. The difference? The new index will exclude the Agency and Agency Mortgage Bonds owned by the Federal Reserve. So let’s consider the consequences. 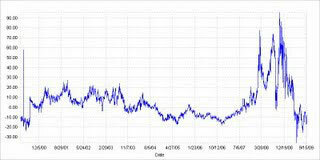 First realize that mortgage borrowing rates are a function of MBS trading rates. If a bank originates a mortgage and then pools it into a MBS, the rate at which it can sell that security is going to determine the rate they will offer a buyer. Second, realize that the Fed has purchased 71% of new Agency MBS issuance so far in 2009, and currently owns about 10% of all MBS outstanding. The Fed has been mostly buying the so-called “current coupon” which is the coupon which produces a price closest to par. Or put another way, the coupon which most newly originated MBS would carry. Currently that is 4.5%. (MBS only trade in 0.50% coupon increments, i.e., there is a 4%, 4.5%, 5%, etc. but effectively no such thing as a 4.75%). Obviously the Fed wants to buy the current coupon because that’s the one that influences current borrowing rates. But as a consequence, the Fed has become the overwhelming owner of the 4% and 4.5% coupons: 90% of the former and 80% of the later. I was all for the Fed’s Agency MBS purchase program when it was first announced, and clearly its been effective at lowering borrowing rates. Certainly its been the more effective QE effort when compared with Treasury purchases. Take a look at the long-term chart of MBS Libor OAS. Now let’s consider Vanguard. Vanguard’s Total Bond Market Index fund is about $65 billion, and thus holds about $25 billion in MBS. 22% of the index is in 4% and 4.5% MBS, so Vanguard would have about $5 billion in these mortgage types. So what’s Vanguard going to have to do? Since the Fed owns about 10% of outstanding MBS overall, they’ll have to sell $2.5 billion in MBS outright (almost all 4% and 4.5% coupons), buying corporates and Treasuries with the proceeds. Then they’ll have to sell an additional $1.5 billion in 4’s and 4.5’s and reinvest in older, higher coupon MBS. Who will the buyer be? Considering that the Fed owns 80% of those coupons already, it isn’t like a deep investor base has developed for those bonds. Maybe Vanguard will wind up selling mostly to the Fed itself. But that just delays the spread widening that is eventually coming. Notice on the chart above that the current coupon spread is at all-time tight levels. Makes sense given the current intervention. But that only has 6 more months to go. Vanguard’s selling should be the start of what will be an extended period of MBS spread widening. On the chart, note that the last time rates were extremely low (2002-2003) Libor OAS was around +20. Currently we’re -10. And you have to expect the majority of the widening to hit low coupons, because that’s what Vanguard/the Fed will either be selling or what they will stop buying. At that point mortgage rates will rise, not in a disastrous fashion, but probably at least 50bps. Then what? The borrower within a 4.5% pool will be way out of the money, which will not only prevent any kind of refinancing from ever happening, but also impair his/her mobility. In other words, those MBS will repay extremely slowly for investors. Then investors are going to look at a 4.5% coupon 30-year mortgage and wonder why the hell you’d accept such a low coupon for so long. And it isn’t like the rise in MBS rates is going to help the macro economy. The decline in existing home sales the other day is very bothersome to those who thought the housing market had bottomed. More data points like that will change my mind.